When it comes to ad placement, everybody knows that a Super Bowl TV spot is THE primo piece of real estate. It’s like nabbing Boardwalk and Park Place with five hotels, while your little brother just stares at the Monopoly board and cries. But are those 30 seconds really worth the $5 million price tag? How does that half-minute serving of nation-wide attention measure up to more modern, optimized forms of marketing? Super Bowl Ads Are They Worth It? 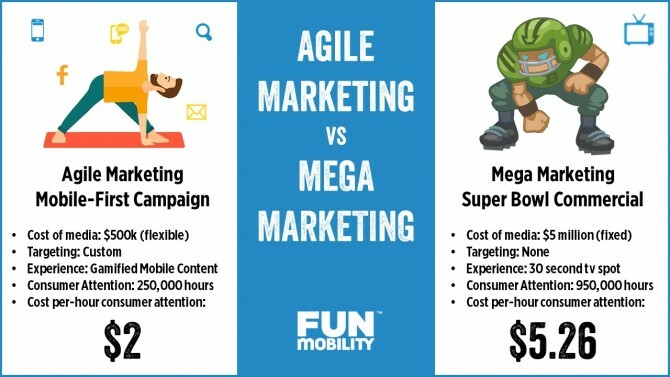 While “Mega Marketing” channels like the Super Bowl will always play an important role for top brands and retailers, the focus is increasingly shifting towards Agile Mobile Marketing, highly-adaptable content that can be quickly created, published, and optimized across every marketing touch point. If you’d like to chat about how an Agile Mobile Marketing strategy can increase conversions for your next campaign, fill out this form and we’ll be in touch.